June 04, 2018 "Information Clearing House" - The 21-year-old paramedic was shot and killed by Israeli soldiers while trying to aid wounded protesters near the Gaza-Israel separation fence. Many Israelis either refuse to believe she was actually killed or claim that her killing was somehow justified. Around two weeks ago, a Facebook friend of mine proposed an experiment to a small group of us. Social media has become a boxing ring, she said. The two sides, left and right, dig into their positions and slug it out in the comments — and that’s if they don’t just “block” each other. My friend suggested that for a month, we try to engage in a productive dialogue with right-wingers on Facebook, even with the most combative of commenters. After all, our aim is to change what and how people think, and to do that, we need to speak to other side. Let’s try it, I said, if only for a month — to see what happens. 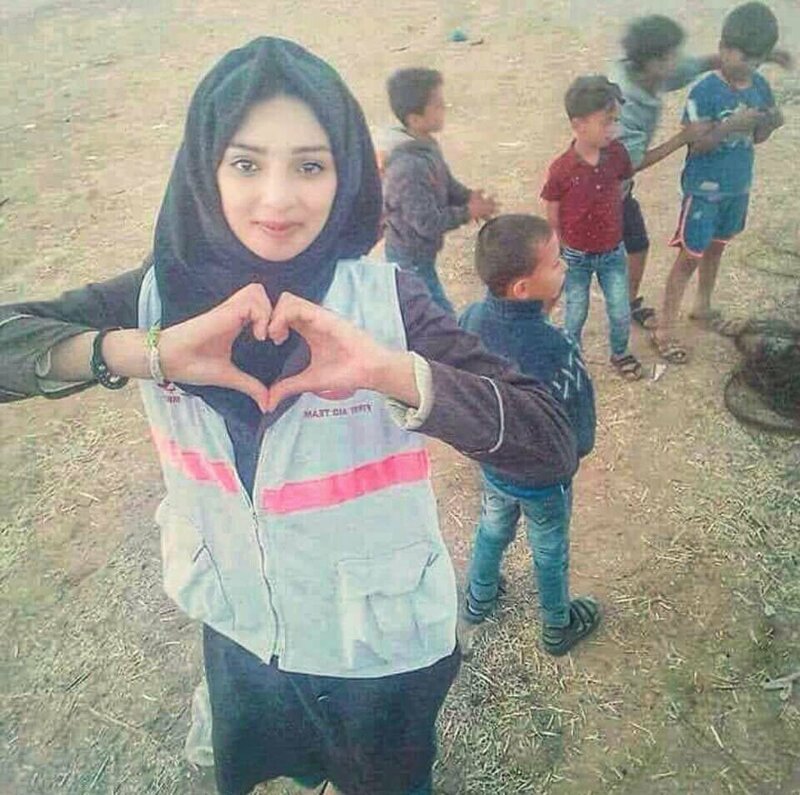 For the past two days, I’ve been thinking about Razan al-Najjar, the 21-year-old paramedic shot and killed by Israeli soldiers Friday near the Gaza-Israel separation fence. According to witnesses, she was wearing her white paramedic’s uniform, attempting to treat protesters near the fence when she was shot. Immediately following Razan’s death, her picture appeared everywhere on my Facebook newsfeed. I, too, shared a post with her picture. The angry responses came quickly. Here was an opportunity to try out the dialogue experiment my friend had suggested, I thought. Maybe because Razan in her white uniform was so different from the image of the terrorist that the Israeli collective imagination assigned the protesters in Gaza, I hoped there would be an opening for compassion, for second thoughts, for a discourse free from blind hatred. I tried to respond with calm, level-headed answers. She didn’t wait for the wounded at the hospital because the Israeli army’s massive use of live fire made it necessary for first responders to be in the field — just like Israeli medics would at a mass casualty event. And no, this is not “how it is in war.” Firstly, this is not a war. This is heavily armed soldiers facing down unarmed protesters. Secondly, even in war there are rules, and sniper fire against medics, journalists and children is a war crime. Hamas did not force her to be there, either; numerous interviews with Razan were published in recent weeks in which she explains why she volunteered as a medic during the protests. Then the more violent responses came, in public and in private messages — bizarre death threats, a lot of toxic invective. What kind of a dialogue is possible when faced with that? Another yet claimed that the entire story of Razan was fabricated, that they put a paramedic’s uniform on her body only after she died. No amount of photos showing Najjar treating wounded protesters over the past month could convince him. Palestinians, to him, are liars by definition. Taken together, the responses reflected the depressing fact that for most of the Israeli public, Palestinians killed by Israeli soldiers are guilty by default. The identity of the deceased or the circumstances of the killing are irrelevant. Many of the commenters who responded to my post made the effort to stress that they were were not right-wingers. One even identified as a supporter of Meretz, the dovish left-wing party. "People ask my father what I’m doing here, and getting a salary. He tells them, ‘I’m proud of my daughter, she provides care to the children of our country.’ And because in our society, women are often judged, but society has to accept us . If people don’t want to accept us by choice, they will be forced to accept us. Because we have more strength than any man. The strength that I showed as a first-responder on the first day of the protests — I dare you to find it in anyone else."